Thanks for your blog IAAD. I would like to know your view on Lumen Gentium 14. Doesn't LG 14 contradict the claim made by some prelates that heretics in heretical sects need not enter the Church? In view of LG 14, can it really be argued that heretics can be saved in their heretical sects without the qualification that they need be ignorant of the fact that the RCC was made necessary (really indispensable) by Our Lord for salvation? If they are aware of this claim/fact as many adult heretics undoubtedly are, and they do not enter the Church, how can a VII partisan really argue that an heretic can be saved in their heretical sect without significant qualification? My point is that there is no doubt that NO prelates have interpreted the VII documents in the manner you suggest, but aren't those prelates rendering LG 14 a dead letter? The pertinent part of Lumen Gentium, the heretical document of Vatican II to which you refer states: "Whosoever, therefore, knowing that the Catholic Church was made necessary by Christ, would refuse to enter or to remain in it, could not be saved" Modernism loves the ambiguous. In what sense of the word is "knowing" used? Is it simple awareness of the claim which you must then investigate or be guilty? (This is the traditional notion, but when was the last time some V2 sect "priest" ever preached that claim?) "Knowing" can also mean "accepting it as true." This is the sense most V2 clerics give to it, so as to excuse virtually everyone from having to convert due to "invincible ignorance." by the grace of the same Jesus Christ, to this unique way of truth and salvation, those in ignorance and error." Non-Catholic religions are not a "means of salvation", since the Roman Catholic Church is the unique way of truth and salvation. V2 is heretical at face value, and its heresy affirmed by the post-V2 "popes." LG 14 is nothing more than confusing Modernist claptrap to deceive people that the Council didn't really teach error. "Fr. Feeney was a Jesuit from Boston excommunicated by Pope Pius XII for his denial of Baptism of Desire (BOD) and Baptism of Blood (BOB), hence the heresy's name." I thought Fr. Feeney was excommunicated for disobedience. What's your evidence for saying it was because of his denial of BOD and BOB? He was excommunicated for disobedience, and that disobedience was for his refusal to appear and give submission for the Church's teaching on BOD and BOB. This can be summed up by the pertinent parts of the 1949 letter of the Holy Office to Archbishop Richard Cushing of Boston. This Supreme Sacred Congregation has very carefully followed the beginning and the continuation of the serious controversy raised by certain associates of the St. Benedict Center and of Boston College, concerning the interpretation of tie maxim: "Outside the Church, no salvation". These things are clearly expressed in the dogmatic letter published by the Sovereign Pontiff Pius XII 29 June 1943 "on the mystical Body of Jesus Christ" (A.A.S., vol. XXXV, 1943, p. 193 and sq.). In this Letter, the Sovereign Pontiff clearly distinguishes between those who are presently incorporated into the Church as members and those who are united with her through desire only. Speaking of the members who form here below the mystical Body, the same august Pontiff said: Only those are members of the Church who have received the Baptism of regeneration and profess the true faith and who are not, to their misfortune, separated from the Body as a whole or cut off from her through very grave faults by the legitimate authority. Towards the end of the same Encyclical, he affectionately invites those who do not belong to the body of the Catholic Church to enter into her unity, and he mentions those who "by a certain desire and unconscious longing have a certain relationship with the Mystical Body of the Redeemer". He does not in any way exclude them from eternal salvation, but he goes on to affirm that they are in a state "in which they cannot be sure of their eternal salvation" and that "they still remain deprived of those many heavenly gifts and helps which can only be enjoyed in the Catholic Church". With these words, the Pope condemns those who exclude from eternal salvation men who are united to the Church only through implicit desire as well as those who wrongly affirm that all men can be saved equally in all religions (cf. Pope Pius IX, Singulari quadam, Denz. 1641 and sq. ; Pius XI, Quanto conficiamur moerore, Denz. 1677). " The act of disobedience was the failure to report to The Supreme Sacred Congregation of the Holy Office regarding his denial of Church teaching. It was not simply failure to do as his superiors instructed in mundane matters. Right. So you admit that he was excommunicated for disobedience and not for heresy. Next question. Has the position of Fr. Feeney ever been condemned as "formally heretical" by the popes? If not, where has it been explicitly condemned, and what is the theological note given to this condemnation? You must believe those teachings of the universal ordinary magisterium held by theologians to belong to the faith (Pope Pius IX). • “For even if it were a matter concerning that subjection which is to be manifested by an act of divine faith, nevertheless, it would not have to be limited to those matters which have been defined by express decrees of the ecumenical Councils, or of the Roman Pontiffs and of this See, but would have to be extended also to those matters which are handed down as divinely revealed by the Ordinary teaching power of the whole Church spread throughout the world, and therefore, by universal and common consent are held by Catholic theologians to belong to faith.” Tuas Libenter (1863), DZ 1683. (c) And the "clincher:" The 1917 Code of Canon Law promulgated by Pope Benedict XV, and adhered to by Popes Pius XI and XII teaches in Canon 737: "Baptism, the gateway and foundation of the Sacraments, actually OR AT LEAST IN DESIRE is necessary for all for salvation." (Emphasis mine) This canon ends the debate on the Church's official interpretation of Canon 4 of the Council of Trent regarding the Sacraments in General. Further, canon 1239.2 of the 1917 Code teaches: "catechumens who through no fault of their own, die without Baptism, are to be treated as Baptized." (Emphasis mine). Conclusion: Therefore BOD and BOB are taught by the universal and Ordinary Magisterium and MUST be believed by all who wish to remain Catholic. In anticipation of the next query, Feenyites believe that ALL theologians would assign the same theological “categories” (“notes,” “qualifications,” etc.) to BOD and BOB if a Catholic were truly obliged to accept the teachings. This is false. Collectively, all the pre-V2 theologians agree that BOD and BOB are “in conformity with the truth presented in the Sources of Revelation and the Universal Magisterium” — otherwise, they would not teach the doctrines. Individually, the theologians may indeed assign different categories to the doctrines —theologically certain, Catholic doctrine, de fide, etc. But any of these categories still place the teaching on BOD and BOB among those teachings to which Catholics must believe and adhere. The specific category assigned is important for another reason. Each has a corresponding theological censure which indicates your degree of error if you deny the doctrines — whether your denial constitutes theological error, error in Catholic doctrine, or heresy. Lastly, no matter what category theologians have assigned to these teachings — theologically certain, Catholic doctrine or de fide — rejecting them has the same consequences in the moral order: you commit a mortal sin against the faith. Right. So the popes have never condemned the absolutist position on EENS as heretical. In fact, they've never condemned it in any way whatsoever. That's why there's no theological note assigned to it, because it's never been condemned. Nor have the popes ever expressly taught either BOD or BOB. Nor have they ever even used those terms in their teaching. Nor have they ever even breathed one word against any Catholic who doubted them. 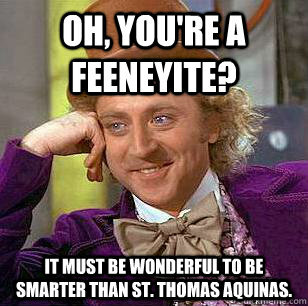 So why call the Feeneyites heretics? True, the ordinary magisterium is infallible and must be adhered to. Nobody denies this. The problem is that unless or until the ordinary magisterium is defined by the popes, it’s often difficult to tell what exactly it is, especially if the alleged ordinary magisterium in question appears to directly contradict the infallible teachings of the popes. For if the defined dogma of the Church is that there’s no salvation outside the Church how can we accept the teaching that there is some salvation outside the Church? It’s completely illogical. And if one of those propositions must be rejected, surely it should be the one that contradicts the infallible teachings of the popes, no matter who is promoting it. But some may claim that if Saint Thomas and other theologians and the catechisms and other sources affirm both propositions, that proves that they are not, in fact, contradictory, and that to affirm both is the true Catholic position. This I deny. The way I see it, there are two proofs and only two proofs of either a contradiction or non-contradiction: 1) an infallible teaching of the pope or a council that there is or is no contradiction, and 2) the intelligibility of the contradiction or non-contradiction in the intellect. Now since the popes have never taught that some salvation outside the Church is compatible with the teaching that there is no salvation outside the Church, proof number one does not apply. Therefore, if a contradiction or non-contradiction is to be proved, it is by proof number two. And since the intelligibility of a contradiction between the two propositions is as clear as day to the intellect, the imputed contradiction is thereby proved. Moreover, that the non-contradiction position is, on the other hand, completely unintelligible to the intellect becomes obvious when you ask someone who holds it how the apparent contradiction can be resolved, they immediately start talking about Saint Thomas, the consensus of theologians, the catechisms, etc., instead of defending their position according to logic or according to its inherent reasonableness, which, of course, it doesn’t possess. But some may say that the teachings of Saint Thomas, the theologians, the catechisms, etc., even though they are not infallible, should trump the private judgments of theologically untrained Catholics. This is true. But to hold inexorably to the infallible teachings of the holy popes and to utterly reject any opinion that contradicts them, no matter from what source, is not to hold to one’s private judgment, but rather to reject private judgment altogether, whether their own or anyone else’s, and to hold firmly to the pillar and ground of all truth. I've never met someone who says "right" only to so invariably get it WRONG! You Feeneyites are SO predictable it would actually be funny if it wasn't so tragic; endangering your salvation and those of other who imbibe your disproven and heretical ideas. Answer: Pope Benedict XV expressly teaches BOD and BOB in promulgating the Code of Canon Law (1917). The Church is infallible. The proposition that the Church could err in Her universal disciplinary Laws was condemned by Pope Pius VI (Auctorum Fidei), Pope Gregory XVI (Mirari Vos and Quo Graviora), Pope St. Pius X (Pascendi Domenici Gregis), and Pope Pius XII (Mystici Corporis). Major Premise: The Church is Infallible and cannot err in Her universal disciplinary laws. Minor Premise: The 1917 Code of Canon Law is a universal disciplinary law. Conclusion: The Church cannot teach error in the 1917 Code of Canon Law. In Canon 737 and Canon 1239.2, the Church teaches BOD and BOB. Therefore, they cannot be wrong as they are guarded by the Infallibility possessed by Pope Benedict XV. If he taught error George, you would have to believe that there has been a state of sedevacante at least since 1914, since he would have lost his papal office! Do you believe that? Error #2: For if the defined dogma of the Church is that there’s no salvation outside the Church how can we accept the teaching that there is some salvation outside the Church? It’s completely illogical. And if one of those propositions must be rejected, surely it should be the one that contradicts the infallible teachings of the popes, no matter who is promoting it. Ergo, those who receive BOD or BOB are members of the Church just prior to the moment of death and die within the Church. Secondly, do you believe that Pope Benedict XV and all those pre-Vatican II theologians were so stupid they wouldn't (didn't) see any contradiction when the declare EENS and BOD/BOB? It's illogical only because you don't understand it. The contradiction is one concocted in your heretical mind, not objective reality. All your ramblings about contradictions and intelligibility are just that---mindless ramblings. Error #4: Moreover, that the non-contradiction position is, on the other hand, completely unintelligible to the intellect becomes obvious when you ask someone who holds it how the apparent contradiction can be resolved, they immediately start talking about Saint Thomas, the consensus of theologians, the catechisms, etc., instead of defending their position according to logic or according to its inherent reasonableness, which, of course, it doesn’t possess. Answer: It is you who are devoid of logic and reasonableness, as I've just explained those who receive BOB and BOD are members of the Church! Error# 5:But to hold inexorably to the infallible teachings of the holy popes and to utterly reject any opinion that contradicts them, no matter from what source, is not to hold to one’s private judgment, but rather to reject private judgment altogether, whether their own or anyone else’s, and to hold firmly to the pillar and ground of all truth. Answer: Pope Benedict's promulgation of the Code of Canon Law (1917) was infallible and teaches BOD and BOB. Therefore, you are rejecting the Church's Indefectibility; She cannot promulgate erroneous disciplinary laws to the whole Church as explained above. It is "universal" as it applies to all Latin right Catholics. It is even "Universal" in the non-technical sense, as the Eastern Rites all possess canons of discipline that state the doctrines of BOD and BOB as in the Latin Rite. In refusing to submit to all but infallible statements of the popes you are condemned by the pope! "The obligation by which Catholic teachers and authors are strictly bound is confined to those things only which are proposed to universal belief as dogmas of faith by the infallible judgment of the Church." As Fr Cekada once said to a Feeneyite: By denying BOD and BOB, you have, ironically, placed yourself "Extra Ecclesiam" where we all know there is "Nulla Salus." Please repent and come back to the Church. You keep saying that the 1917 Code of Canon Law infallibly teaches BOD, but don't you know that the ancient law and custom of the Church for the previous 1900 years was to deny unbaptized catechumens both Christian burial and the prayers of the Church? I guess it took the Church 1900 years to learn that you don't need water baptism, all you really need is desire, baby. I'm really glad that the Church wised up and changed that law. Things have gone so much better since she did, right? Also, you say that someone can become a member of the Church without the sacrament of baptism, so I guess you'd have to say that Pope Pius XI was wrong when he wrote in Quas Primas: "The gospels present this kingdom as one which men prepare to enter by penance, and cannot actually enter except by faith and by baptism, which, though an external rite, signifies and produces an interior regeneration." How could the pope say that one cannot enter the kingdom except by the external rite of baptism? This is blatant Feeneyism. Pius XI must have been a heretical anti-pope, right? So it was the practice to exclude those who by their own contempt and neglect failed to be baptized. The law hasn't changed, it's identical to ancient practice!! Once again, the Church is infallible when promulgating universal discipline as did Pope Benedict XV. What got worse were those who, not understanding the Catholic Truth distort it to where everyone receives "BOD" and goes to Heaven. Pope Pius XI was explaining the ordinary means. Did he not adhere and accept the Code of Canon Law which admits of BOD and BOB? You're setting up a false dichotomy. Wouldn't he have contradicted Pope Pius IX in "Quanto Conficiamur Moerore"? "Here, too, our beloved sons and venerable brothers, it is again necessary to mention and censure a very grave error entrapping some Catholics who believe that it is possible to arrive at eternal salvation although living in error and alienated from the true faith and Catholic unity. Such belief is certainly opposed to Catholic teaching. There are, of course, those who are struggling with invincible ignorance about our most holy religion. Sincerely observing the natural law and its precepts inscribed by God on all hearts and ready to obey God, they live honest lives and are able to attain eternal life by the efficacious virtue of divine light and grace. Because God knows, searches and clearly understands the minds, hearts, thoughts, and nature of all, his supreme kindness and clemency do not permit anyone at all who is not guilty of deliberate sin to suffer eternal punishments. " Attain eternal light by divine light and grace. No mention of the external rite of Baptism. So which pope is the heretic? Neither, since Pope Pius IX was speaking of extraordinary means and Pope Pius XI of ordinary means. Example: If someone says, "You must eat in order to live. You will starve to death otherwise." He speaks the truth. This is the normal way we live under the biological laws created by God. Someone else says, "You don't need to eat if God allows you to survive and thrive by a miracle." This is also true. It does not contradict the first statement of ordinary means. However, I will eat and not depend upon God for miraculous intervention as in the case of some saints who lived many years only consuming the Sacred Host at daily Communion. BOD is a miracle of grace in the supernatural order, but it is rare and we cannot depend on it to save other. Hence, the Great Commission. who died before baptism. There is not a vestige of such a custom to be found anywhere. As for the statement of Pius IX, you're reading your own assumptions into his words instead of reading them in the light of the Catholic doctrine of EENS, which holds that outside the Catholic Church there is absolutely no salvation. Notice that the Holy Father does not say that good men without baptism or the Catholic faith can be saved even if they die without those things, but only that they "are able to attain eternal life by the efficacious virtue of divine light and grace." What his Holiness says is absolutely true, and no one denies it. But what, I ask, do you suppose the substance of that "divine light" is? Why surely it can be nothing other than the holy Catholic Faith, without which it is impossible to please God. So the good man, by the grace of God will come to know the true faith. And how about that "grace" which is "efficacious...to attain eternal life," is this not what is known as sanctifying grace? And how is sanctifying grace conveyed to men? By the waters of regeneration, of course. So there's no contradiction between the Holy Father's statement and the absolute necessity of water baptism. If you want to prove the a pope has bought into BOD, you're going to have to find an instance where he explicitly says that someone who dies without baptism can be saved. Everything else is just wishful thinking on your part. "The Fathers and theologians frequently divide baptism into three kinds: the baptism of water (aquæ or fluminis), the baptism of desire (flaminis), and the baptism of blood (sanguinis). However, only the first is a real sacrament. The latter two are denominated baptism only analogically, inasmuch as they supply the principal effect of baptism, namely, the grace which remits sins. It is the teaching of the Catholic Church that when the baptism of water becomes a physical or moral impossibility, eternal life may be obtained by the baptism of desire or the baptism of blood. " Were the authors schizophrenic? Obviously, they are compatible, and the older sources confirm that only catechumens who were not baptized by virtue of their neglect or contempt. As to Pope Pius IX, you're correct insofar as divine light and grace come to humans through baptism, or in the words of the Council of Trent "the DESIRE THEREOF." Moreover, check out the Catechism of Pope St. Pius X which expressly teaches BOD and BOB. Feeneyites have tried desperately to show he didn't write it--but he GAVE HIS FORMAL APPROVAL. That would make him, like Pope Benedict XV, a heretic. None of this really matters. Because you, George, know more than St. Thomas, St. Alphonsus, all the pre-Vatican II theologians, all the pre-Vatican II catechisms, and thereby reject the Ordinary Magisterium--and come under the condemnation of the Syllabus of Errors #22, seeking to obey only infallible pronouncements of the Pontiffs. Pity. The saint's are mortal fallible men and women.Its possible someone in our present Era could be smarter than the Saint's. "As explained above, those who receive BOD are infused with both Faith and Sanctifying Grace, this precludes ignorance at that point and they are members of the Church!" Don't you know, Introibo, that the (heretical) Holy Office Letter that condemned the Feeneyite position expressly denied that one has to become a member of the Church at all. Suprema Heac Sacra: "Therefore, in order that one may obtain salvation it is not always required that he be incorporated into the Church actually as a member, but it is required at least that he be united to by intention and desire." See? Membership is unnecessary. All you need is desire. This is why after this letter was published the newspaper in Worcestor, MA ran a headline saying: "Church rules that there is salvation outside the Church." As the Feeneyites themselves are quick to (correctly) point out, that letter was never published in the Acta Apostolicae Sedis (AAS) where all official acts of the Church are registered. Without such registration it has no magisterial force, and officially does not exist as far as the Church is concerned. I only use those parts that express the True teaching and explain why Feeney was investigated and ultimately excommunicated. It does a poor job (to say the least) of explaining the teaching of the Church. Heretic Fr Karl Rahner used that letter to distort the teaching and make way for his damnable "universal salvation" by being an "anonymous Christian." As my spiritual Father, the late, great Fr. Gommar DePauw used to say about clerics such as Cardinal Marchetti-Selvaggianni who wrote that letter, "They didn't become bums overnight." The Modernists had been pushing toward V2 long before 1962. With that statement, Introibo, I have to say that your position on BOD is pretty close to that held by St. Thomas, Saint Alfonsus, and others, which I cannot call heretical, although I am so bold as to disagree with it. No pope has ever condemned, although many, I believe, have taught contrary to it. Those Saints, however, all held that one must explicitly hold the Catholic faith in order to receive BOD. I believe you have said implied faith is sufficient. Correct me if I'm wrong. Let me make clear: Invincible ignorance does not--indeed cannot---save anyone. However, those in such ignorance will be excused for not having the Faith. If they live honest lives, are always open to God's Grace and willing to please Him, God can avail them sanctifying Grace and infuse them with the Faith (therefore no longer ignorant) just prior to death in order to be saved. It is a miracle, it is rare, and we must not think every native in a backwards place will be saved like this so as to neglect the Great Commission. Then what's the point of being catholic? I will just desire to be catholic, it's all good. In your case, you should desire to understand Church teaching. Then you would understand why your statement above is anything but good, and completely ignorant.